I don’t remember any solar eclipses in my past. Perhaps they weren’t significant enough for my brain to say “This is important, we should remember this.” I don’t know if I’ve ever seen a falling star either. Yes, I’ve lived a natural phenomenon free life so far. However, just the other day we got the opportunity to experience the Solar Eclipse of 2017 that went right across the United States of America. My good friends here visiting from Australia were directly in the path of the total blackout. So their experience was much grander than ours. We still had fun even it was only about 70% coverage. The boys and their dad made pin-hole projectors. We had all the supplies we needed for the projectors. A cardboard box, white sheet of paper, glue, scissors, tape and some aluminum foil. Boom. Done. Even if we didn’t have the stuff to make the projectors, apparently you could have used a colander from the kitchen and held it up, and it would have projected in the same fashion as the boxes. Who knew? NASA of course! We learned this when we watched the live NASA feed on YouTube. 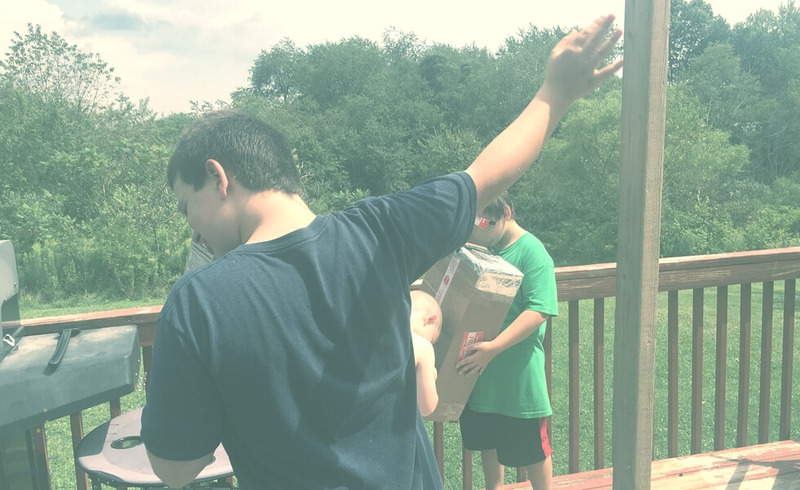 The boys also learned many other things like during the eclipse, space smart people have just a few moments to see the rays of the sun in a new way. They launched weather balloons and all sorts of scientific items to learn something in just a couple minutes. Reminds me of the movie Twister. 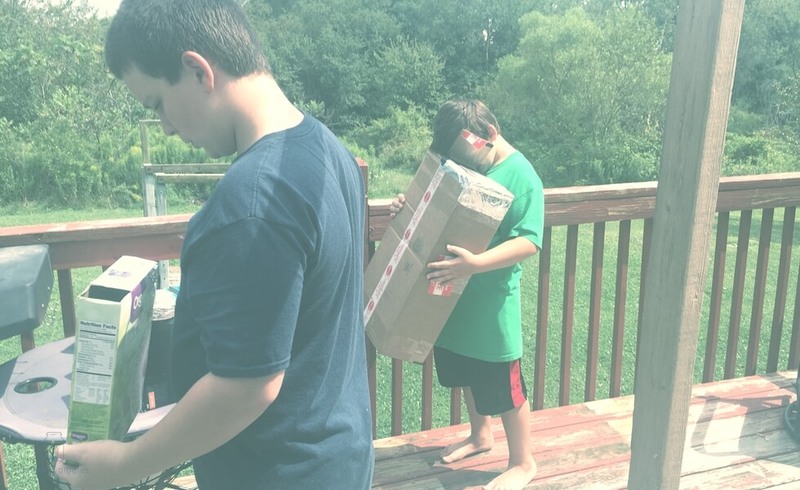 The boys making Solar Eclipse Pin-hole Projectors with dad. 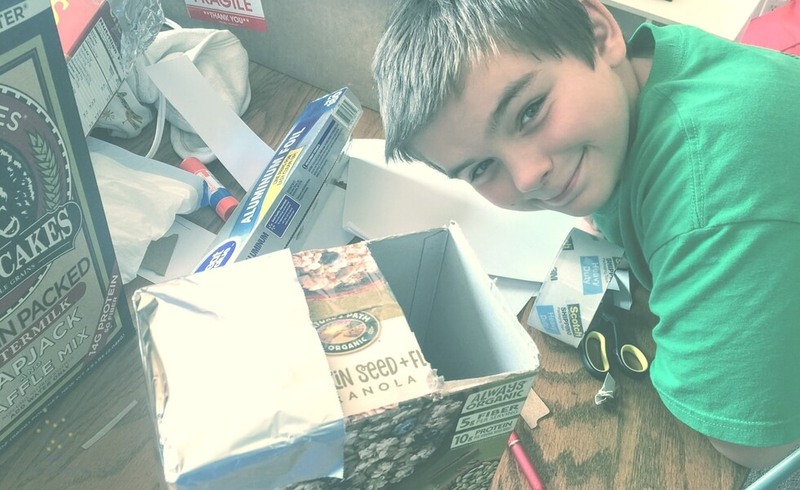 Of course, when the boys were making their projectors from cereal boxes and anything of that size they could find, dad decided to make one of his own. “Go big or go home,” he said. It turned out just as he had hoped and for blind folks like me (bifocals when I was just a teenager!) having the larger projection made it a breeze to view. As the older ones were finishing up their boxes, Mr. T started using all the paper and making these little black figures. We asked what he was drawing, and it was Duke. So that he could see him anytime, he wanted. Which reminds me I need to print a photo of Duke out, so the boys will have it to look at. I should probably back up a little bit. Duke Skywalker is our black lab mix that we had in our lives for about a year and a half. A dog that has been sleeping with the boys for about six months. One that was so gentle with our little Molly when they would play. He’d lay on the ground and just let her go at it. She being only 4ish pounds and smaller than his head didn’t get very far. But it wore her out and I know they loved each other. This past Sunday, he went to live with a new family. We had spent months weighing the pros and cons of keeping him as we embark on this journey and the cons won out. It’s okay though. The new family is amazing, and Duke is now super spoiled! The daughter had wanted a dog for a very long time. 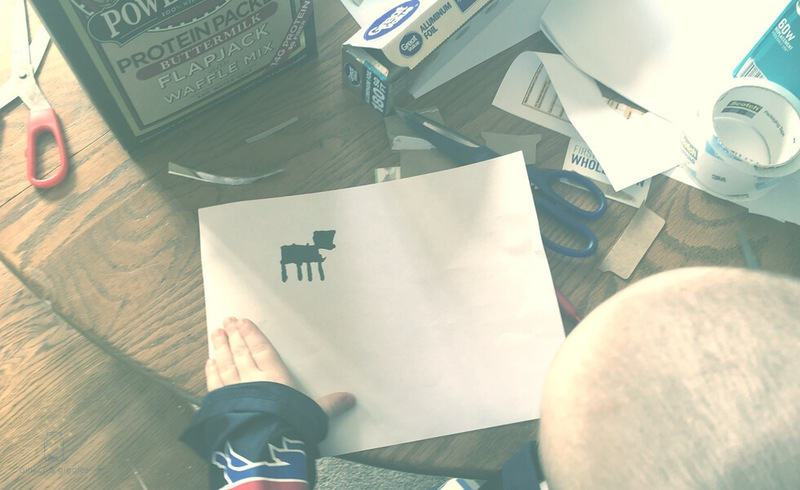 The family had been researching and studying different breeds of dogs. They had gone and met a few dogs, but nothing felt right. That’s until Duke came along. It was just right. So now he’s in a gorgeous home with four kids (yep, just like us!) that are playing and snuggling with him. They’ve been great in sending us updates on how he is doing, and it seems he has picked their daughter as his person. The boys miss him and he comes up randomly in conversation. Wondering about what he is doing right now and weighing out the possibilities. And like the other day, making a little drawing of him. He’s missed and loved. It’s all meant to be. It was entertaining just watching the boys and Marty twisting and turning finding the perfect angle for their body and box. Hearing the signs and sounds of glee. And then the clouds came… lots of big, gray storm clouds. No drops fell, but spirits were broken. An already heartbroken and sad Karter used this moment to have a melt down. 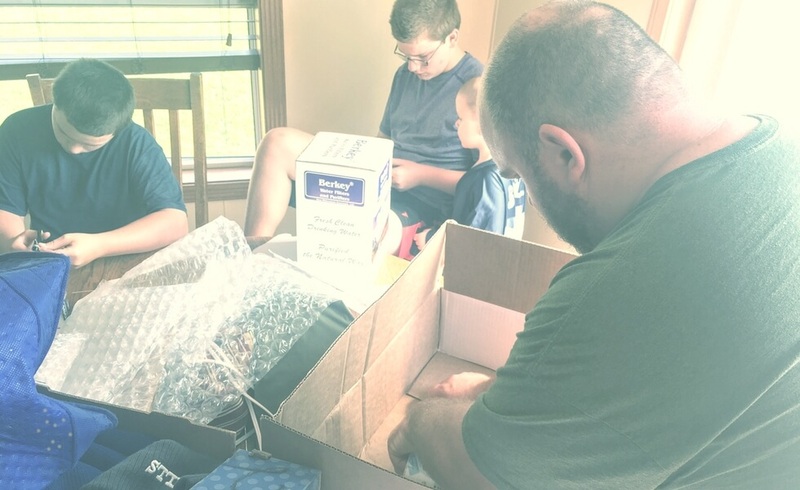 Angry that we had spent all that time making the boxes and reading about eclipses and what to expect. Now nothing but dark clouds over our heads. Perhaps it was all metaphors for how he was feeling about Duke being gone. Maybe it was his nervousness for our journey coming out. I don’t know, either way, it reared its ugly head with a not-so-fun temper tantrum by an eleven-year-old. Mr. T drawing of Duke Skywalker. How do you help your child through what may seem to them as their world crashing down? I’m serious. I’ve never had to do this before. We’ve gone through so much over the last two years that I just am feeling numb. From Marty’s heart attacks to difficulties with my work to now loved members of the family going away, our house being for sale, and an upcoming international journey. I’m trying to be a child whisperer, but I’m not there yet. I just starting to figure out their types and love languages. Finding out why one kid butts head with me more than others is an interesting and humbling process. What makes them tick and what makes them feel at ease. If Karter’s anything like me, he’s desperately searching for that one thing to hold steadfast. That one thing that isn’t changing or isn’t going to change. And right now it feels like you’re drowning. Reaching out clawing and digging for anything to hold onto. And just as we had given up on the eclipse, the skies parted and allowed the sun to shine right into our little projectors. Karter calmed down and was laughing as he said the sun looked like the cat from Alice in Wonderland. A giant smile. See….it all works out in the end! 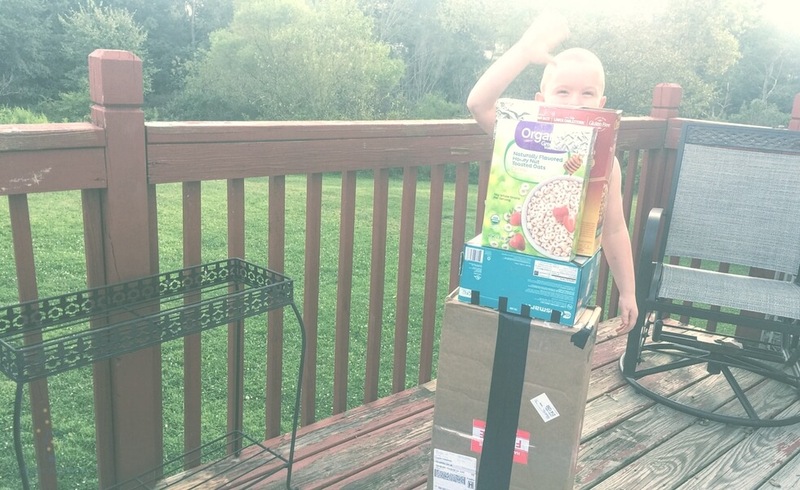 Thanks for sharing your eclipse story. I’m glad you found a good family for your dog. This week our cat got out while she was being watched by friends and now she’s missing so I can relate to sad pet feelings with kiddos.